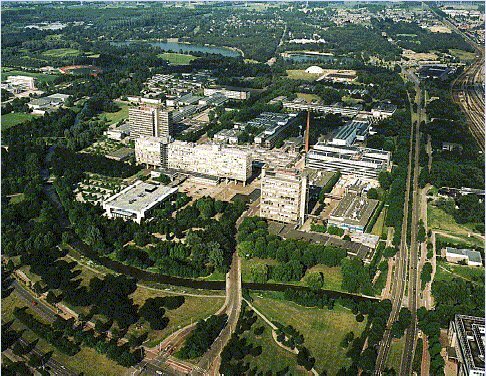 Eindhoven University of Technology, and within it the Department of Mathematics and Computer Science, has existed in its current form since 1986. It was in that year that the educational institution was designated a 'university'. Prior to that, the university was known as a 'technische hogeschool' ['higher school of technology']. The programs we offer within our department have been in existence since long before 1986, however. In fact, the first one was launched in 1957. 1957: Launch of the Mathematics department In 1957, the Mathematics department of the Higher School of Technology was created in Eindhoven. From that point onwards, students were able to follow a Mathematics program. The department was expanded and led until 1965 by Prof. J.J. Seidel. It began life in 1957 with 11 staff members and by 1965 that number had increased to 80 staff members. In1960, the mathematics engineering program was launched, which was followed by the computer science engineering program in 1981. Halfway through this time frame, in 1971, the Computer Center became independent. This had come to form a rapidly-expanding part of the Mathematics sub-department since the acquisition of the first computer in 1961. As a result of the conversion of the higher schools of technology into universities of technology in 1986, the sub-department became a department in its own right. The subject groups that had developed in the 1970s changed into groups as a result of a later reorganization of management (in 1997). By the start of 2010, the Mathematics group had seven fields of expertise, while the Computer Science group had nine. In 2010, the department was organized into the section structure that we are familiar with today. A significant new direction in the programs offered by our department was the introduction of the designer programs Mathematics for Industry (which carries the same title today) and Computer Science Technology (now Software Technology) around 1990. Since then, the programs have jointly delivered more than 500 technology designers, who may carry the title PDEng (Professional Doctorate in Engineering). Information Security Technology (within the Computer Science and Engineering Master's program). From 2002 onwards, we also welcomed a major influx of students, mostly graduates from other countries, into the Master's programs. This significantly boosted the international image of our teaching. For further information, please refer to the programs we offer. The transfer of our expertise to the business community has always formed one of our university's important tasks. The Instituut Wiskundige Dienstverlening Eindhoven (IWDE) was operating from 1988 onwards. Over the last decade however, we have seen a significant boost to knowledge valorization with the establishment of the Laboratory for Quality Software (LaQuSO) in 2004 and the Laboratory for Industrial Mathematics Eindhoven (LIME) in 2006. LIME ceased to exist in 2011. The past three decades have seen many a change in terms of structures and activities, but always under the banner of Mathematics and Computer Science. The department at Eindhoven therefore enjoys special status nationally. At other universities, the units of Mathematics and Computer Science often form part of larger departments with electrical engineering (TUD and UT) or natural sciences (this is the case at the majority of comprehensive universities).